Based in Kent’s Medway towns, Upcdownc describe themselves as a “progressive, sludge, horror synth outfit”. I’d go one step further and say they were a “fun” progressive, sludge, horror synth outfit. The band has been around for a long time – I think that this is their 19th Bandcamp release! I’m approaching this review as if they are a new band because they are new to me. I infer from their accompanying notes on Bandcamp that they have undergone a few changes in line-up and are presently a three-piece. I briefly dipped into some of the previous releases and there was some evidence of screamo (is it?) but, mercifully, not here. They use synthesisers, but I’m left with the impression that they are a guitar-oriented band. There’s always some debate going on about genres on some corner or another of the Interwebs, and there are plenty to choose from. Adding another genre label borrowed from another art form is nothing new. There’s seemingly less debate in film. If music shared the same labels for genres as film we’d have Action-Adventure Metal/Comedy Skiffle/Acid Crime/Drama – more an album by Yes than a genre – Heavy Horror/Romance & Blues/Prog-Sci-fi /(Country &) Western music; and there is indeed a crossover between the two arts. Over the years a plethora of acts from Alice Cooper to Slipknot have tapped into this with varying degrees of tongue-in-cheek and success. Horror is a tricky one. It is so hard to capture this in music without coming across as camp and terrible: like the Roger Corman film Frankenstein Meets the Space Monster, or cheesy, like pretty much any Hammer Horror film. Close your eyes and picture that publicity shot of Christopher Lee with fangs looming at you. There you go. Few films in the genre make the hairs stand up on the back of one’s neck. How tall an order to do this as a rock band on a music album devoid of visuals without attracting pointing fingers of fans in a Bodysnatchers stylee (the 1978 version) and cries of “cliché”? 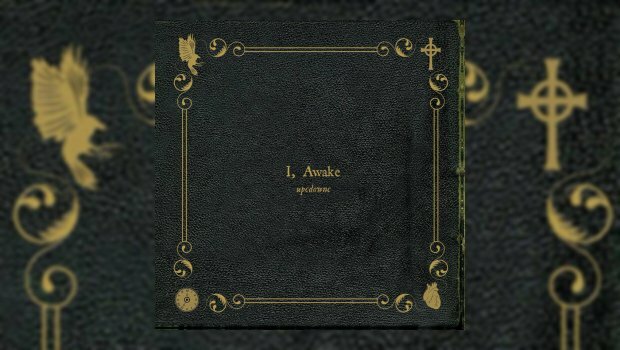 I, Awake appears to be an ambitious concept album. It is Dickensian in its collection of segued instrumentals exploring dreams, fears, anxiety and night terrors in the state between sleep and the waking World. The mainly short track album also features samples of ticking clocks, heavy breathing, a snoring Staffordshire Bull Terrier, bird song, alarm bells and that hospital machine that goes “beep, beep, beep, beep, beeeeeeeeeeeeeep”, to help set the moods. This album works best where Upcdownc have kept the tracks short, moving quickly on to the next. This isn’t because I want it to be over, I hasten to add. Let me make this clear: I did enjoy this album. No, these short tracks pass quickly in the way that something you’ve enjoyed has finished and you realised that time had little meaning during that time. Where it works less well in recorded form is in the longer, heavier, riffier tracks… and Upcdownc do like to riff. Riffing bands often have great fun when they’re playing in the groove and as an audience member in a live situation it is easy to get sucked in and do the head-bob thing and go with it. It is very much media dependant for me, however, as such tracks don’t always convey the groove, ambience, feel nor the power of the riff to the recorded medium. There’s a danger that the groove is supplanted and undermined by repetition. Everyone loves a concept album. Oh yes you do, admit it. Sgt. Pepper, Tommy, The Lamb Lies Down On Broadway, The War Of The Worlds, The Wall, Grease. They fuel the imagination and are pure escapism. Mostly they have a narrative. They put images in your mind. I’m going with it. Starting with Part 1 of the opening track Am I Awake, I’d be in that state between asleep and awake and in a strange mood. It bleeds into a more conventionally tooled guitar/bass/drum combo in Part 2, the heavy metal version of BBC Radio 4’s Today Program on the Alarm Clock Radio. If I wasn’t awake before, I am now. I’m calming down now for Part 3, this must be the bit long after the night sweats section where I wake up wondering why life is so short and will I ever be in control of my own destiny. But where am I? What happened last night? Was I drinking heavily with my neighbour and was I left for dead? I’m in a badly lit, tiled Victorian subterranean public lavatory, my face pressed against the cold, ceramic floor, with the sound of dripping water reverberating all around me. Someone – or something – is watching me. This makes me frightened but vengeful and angry and I seek to extract my revenge on Robert Neighbour by listening to a Theremin through a fuzzbox at full volume with a speaker against the wall. I get up and play some Doom on the XBox. By Part 1 of Awake I’ve had coffee and I’m in the tool shed, sawing furiously through a tree trunk with a hand saw for some reason until someone gives me a happy pill at the beginning of Awake, Part 2. I actually wake up screaming! Oh God, what a horrible dream!!! On second thoughts, no. You listen to the album, find your own imagery. The album concludes with 16 minutes of Black Dracula. As the video shows, clearly this band is very much geared to playing live. Despite being such a similar arrangement, the live version conveys more atmosphere and energy. It is riddled with texture. My problem is that during the familiarisation process before writing the review, I invented a new Dracula Vernacular and now I keep thinking of the word “Blackula”. Chuckling at the thought of a 1970s cross between Shaft and Dracula, resplendent in wide-lapelled plaid jacket, tall shoes, all Cortina orange and flared beige; an enormous afro casting ghostly shadows over a leering, fanged grin. [A bit like This One? – Ed.] This is unlikely to be the reaction that Upcdownc were trying to elicit. I would place money on it. (I can’t resist cramming words together. I once co-wrote a song with the working title “Tobleraubergine”). Here’s the thing, though – who can blame the band for tapping into the Vampire legend? The myth and image of such a monster in humanoid form is still extremely compelling (though the book be painfully pedestrian). Upcdownc are obviously alluding to the disturbing romance of the original Bram Stoker novel. But there’s a lot of mental luggage for me associated with Dracula. Trunks full of terrible, laughable movies with Bela Lugosi and Christopher Lee. OK, maybe the superfluous addition of the word “black” doesn’t help. How high and tight a tightrope high-wire does one balance upon when trying to use such a famous image, visited so many times before? If you should fall then how strong must the safety-net of talent be to protect you from hitting the cliché-covered floor? Sustaining a split lip and other head-wounds in the mosh pit I think it would all become crystal clear, and the recorded version would serve as a perfect reminder of what the band achieves live. I’m left with the impression that this is a heavy riffing live band and I want to hear them where they might express their art – for make no mistake: the Riff is an art form. The album has a variety of tempos, guitar and synth effects and musical moods. I’m probably not the right audience for the recorded versions of these songs. I know plenty of people who would love this album and well they might as it is well performed and mixed. There’s a deep affection on a cultural level for other bands who have tried to do what I think Upcdownc is tapping into here; people who would make a connection, whether consciously or subconsciously, sensing a link between this music and the music of bands who have come before, perhaps Black Sabbath? The demographic I describe really need to hear this album. The question remains: overall do Upcdownc avoid the cheese? Despite my flippant review and at the risk of contradicting myself, yes, I think so! It’s a brave thing they’ve attempted, though I doubt they realise it. I will be looking for the opportunity to see Upcdownc live. I think that’s the medium in which they will truly come alive.